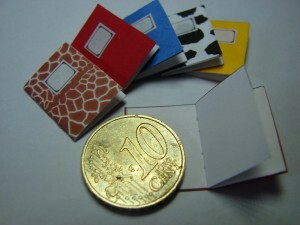 The file holders are manufactured in four colours, black, grey, green or red. The spine of the file holder has a silver coloured ring and a special label. 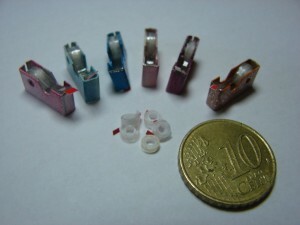 The file holder contains a two rings silver coloured ‘mechanism’, with five different coloured sheets which subdivides the different documents. 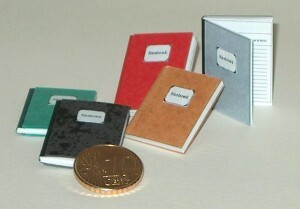 The cash-book is manufactured in five different colours, green, red, black, light grey or brown. The spine of the book is made of textile print paper. The front side has a label saying ‘cash book’. The inner side has a so-called cash-book device with month, receipts, expenses. The price of this book is € 8. These exercise books are available in five colors, red, blue, yellow, black/white ‘cow print’ and brown/white giraffe print. The book has, like an 1:1 exercise book two staples in the spine. 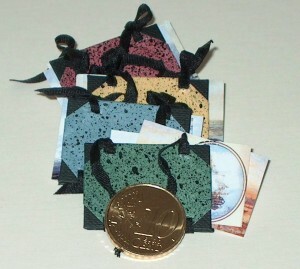 On the cover is a label attached. On request I can write a text on the label as well as on the first page of the exercise book. 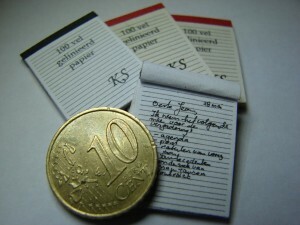 The block “100 sheets ruled paper” is obtainable in two variations. White paper with a black top border or recycled paper with a red top border. The block is available in 6 languages; Dutch, English, German, French, Spanish and Swedish. It contains a front sheet, 11 ruled ‘blank’ sheets and a cardboard back. On request I can write a preferred text on the first sheet. A beautiful portfolio in various colours imitation leather or bookbinders linen. On the inside of the map you will find; at the left side a little compartment with envelopes and at the right side a writing block containing ten pages. 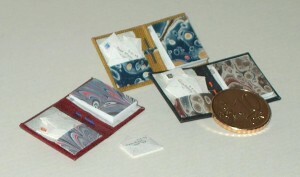 The front of this block, as well as the envelope compartment is made of a matching coloured hand marbled paper. A genuine miniature pencil is placed in the spine of the map. It contains one roll of scotch tape. Two extra rolls of scotch tape will be added when you purchase the scotch tape in tape dispenser.